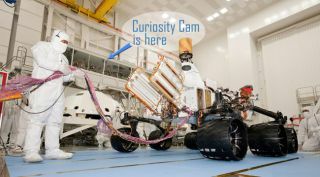 NASA's Curiosity Cam allows the public to watch technicians assemble and test NASA's next Mars rover in a clean room at the Jet Propulsion Laboratory, Pasadena, Calif.
NASA'snext Mars rover is living up to its name. More than 1million people have logged on to watch the construction of Curiosity,as therover is called, since NASA began broadcasting the work on the Internet. Morethan a million unique viewers spent a combined 400,000hours watching the rover-building webcast between Oct. 21 ? when thewebcastbegan ? and Nov. 23, NASA officials said. The daily webcast and chatshavecontinued since to keep the public up to date on the Curiosity rover'sconstruction. Theweb camera is mounted in the viewing gallery of theSpacecraft Assembly Facility at JPL. While the gallery is already aregularstop on JPL's public tour for on-site visitors, NASA's Curiosity Camallowsvisitors from around the world to see the space agency's engineers atwork. Atscheduled times, viewers can also interact with eachother and JPL rover staff via Curiosity Cam, according to NASAofficials. TheMars Science Laboratory is one of the most technologicallychallenging interplanetary rover missions ever designed, NASA officialshavesaid. Curiosity is designed to drive longer distances over rougherterrain thanprevious Mars rovers. Thenuclear-powered rover will investigate whether the regionaround its Martian landing site ? the choice of which is still beingfinalized? was ever capable of supporting microbial life, NASA officials said. Curiositywill carry a science payload 10 times heavier thanthe instruments on NASA's twin Spiritand Opportunity rovers, which have been tooling around theMartian surfacesince early 2004. ThisSPACE.comgraphic shows the instruments that will be aboard thecar-sizedCuriosity rover,which is twice as long and four times as heavyas Spirit or Opportunity. Monthsof assembly and testing still remain before Curiosityis ready for launch from Cape Canaveral, Fla. The rover and spacecraftcomponents will be shipped to NASA's Kennedy Space Center in Floridanextspring. The launch is due to occur between Nov. 25 and Dec. 18, 2011,andCuriosity is slated to arrive on Mars in August 2012. Continuouslive video of rover construction isavailable at NASA's JPLvideostreaming channel here.